I often tell you not to identify even me with this particular body. You do not understand. You call me by only one name and believe I have only one form, but there is no name I do not bear and there is no form which is not mine. Just before the beginning of the current age in which we are living (known in the East as the Kali or Iron age), the sage Markandeya recorded a conversation he had with God Vishnu (the embodiment of the preserver aspect of the trinity). In a passage in the Mahabharata text, it is recorded that Vishnu spoke of a time during the darkest period of the Kali Age when human values would deteriorate, violence and injustice would be widespread, falsehood would triumph over truth, oppression and crime would be prevalent. Vishnu told how he would take a human birth in order to intervene and set the world on a new course. Here is the text of that statement. When evil is rampant upon this earth, I will take birth in the family of a virtuous man, and assume a human body to restore tranquility by the extermination of all evils. For the preservation of rectitude and morality, I will assume an inconceivable human form when the season for action comes. In the Kali Age of sin I will assume an Avatar form that is dark in color. I will be born in a family in south India. This Avatar will possess great energy, great intelligence and great powers. Material objects needed for this Avatar's mission will be at his disposal as soon as He will think of them. He will be victorious with the strength of virtue. He will restore order and peace in the world. This Avatar will inaugurate a new era of truth, and will be surrounded by spiritual people. He will roam over the earth adored by the spiritual people. The people of the earth will imitate this Avatar's conduct, and there will be prosperity and peace. Men will once more betake themselves to the practice of religious rites. 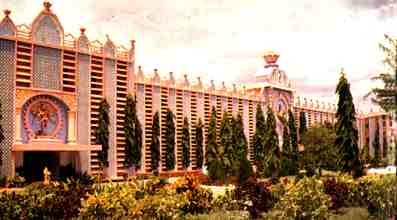 Educational centers for the cultivation of Brahmic lore, and temples, will reappear again everywhere. Ashrams will be filled with men of truth. Rulers of the earth will govern their kingdoms virtuously. The Avatar will have an illustrious reputation. 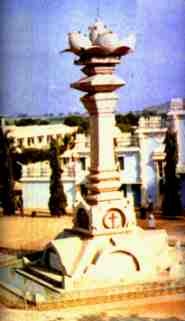 The Avatar mentioned in this text is referred to as the Kalki Avatar. The advent of this Avatar has been known of and predicted for thousands of years in various holy books and obscure texts including the Book of Revelations, Nostradamus in his book Centuries, The Ocean of Light (an ancient Persian manuscript of the revelations of Prophet Mohammed),and the Shuka Naadi Granthi - containing detailed prophecies of the Kalki Avatar written on hundreds of palm leaf manuscripts by Sage Shuka over 5000 years ago. The time of great evil mentioned in the prophecies corresponds to the Twentieth Century with its World Wars, regimes of mad dictators and authoritarian rulers, nuclear weapons, famines, diseases, pollution, crime, violence, catastrophes, and worldwide decline of morality. The Western mind is capable of believing in Jesus as the Son of God, at least on the part of some of the population, but seems unable or unwilling to grasp the concept of the Avatar as an incarnation of God. By contrast, the average Indian is aware of historical Divine personalities and Eastern literature is full of descriptions of the various Avatars. The Bhagavata text is precisely about the various Descents of the Divine on Earth. No one can understand my Mystery. The best you can do is to get immersed in it. It is no use your arguing about pros and cons; dive and know the depth; eat and know the taste. You must dive deep into the sea to get the pearls. What good is it to dabble among the waves near the shore, and swear that the sea has no pearls in it and that all tales about them are false? 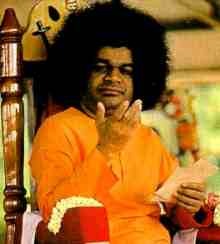 So also if you must realise the full fruit of this Avathar, dive deep and get immersed in Sai Baba. Half-heartedness, hesitation, doubt, cynicism, listening to tales, all are of no avail. Concentrated complete faith - that alone can bring victory. In truth you cannot understand the nature of My Reality, either today, or even after a thousand years of steady austerity or ardent inquiry, even if all mankind joins in that effort. But, in a short time, you will become cognizant of the Bliss showered by the Divine Principle which has taken upon itself this sacred body and this sacred Name. Your good fortune, which will provide you this chance, is greater than that which was available for anchorites, monks, sages, saints, and even personalities embodying facets of Divine Glory. Do not allow doubt to distract you; if only you will install in the altar of your heart steady faith in My Divinity, you can win a vision of My Reality. When Krishna lived on the Earth, few were aware of his divinity although he successfully accomplished his mission of ridding the earth of many powerful and evil personalities. Shirdi Sai Baba was an incarnation of God Shiva but most regarded him as a very great saint. Only a few of his closest devotees knew him to be an incarnation. It is difficult to grasp the implications of the Divine in human form. If we accept the Advaitha philosophy that there is One only without a second; nothing but God throughout the manifested universe and beyond, then logically we are in God, God is in us, we ARE God. The Atma within us - our innermost awareness is the Eternal Witness, a spark of the Eternal Flame. God enjoys the play of this universe by sporting inside the various manifested forms as the Atmic awareness of each. All this apparent diversity is the only the illusion of Maya - the formless taking on form, the Eternal manifesting in time and space and then indwelling each form as the Atmic spark within. Thus He sees all, knows all, is all. Really the form of the Avatar is like a focal point wherein this colossal Divine force can contact the human in the tiny knot of energy that is our Earth, on the fleeting time scale that is a human lifetime. 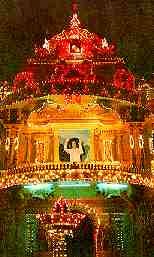 But the Avatar is in no way limited by the constriction of bodily confinement because He is one with the source of all. The Avatar takes the human form and behaves in a human way so that humanity can feel kinship with the divinity. At the same time he rises to godly heights so that mankind also can aspire to reach God. People could not stand the Lord in super-human form. ... If the Lord came in all His majesty people would be afraid and would have no opportunity to know and love him. It is only when the Lord comes in a human body that people are able to approach him and learn to love him and know him even a little bit. But one should not make the mistake of thinking that is all there is. ... For instance, the airplane flying high in the sky descends to the airport. But one should not make the mistake of thinking that the plane is a ground machine because they see it on the ground. In like fashion, although the Lord has made a landing here on earth, so to speak, He is not limited to His human form. I am new and ever ancient. I come always for the restoration of Dharma (righteousness), for tending the virtuous and ensuring them conditions congenial for progress, and for educating the "blind" who miss the way and wander into the wilderness. Some doubters might ask, can Parabrahman assume human form? Well, man can derive joy only through the human frame; he can receive instruction, inspiration, illumination only through human language and human communication. The Avatar appears to be human and we are misled into thinking of him in these terms but the Avatar himself warns us against this error. 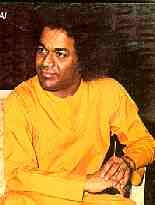 Sathya Sai Baba once responded to a devotee who asked when he should return for another visit: "First understand that you do not need to come back to see this little body", he said pointing to himself. Then he added - "Find me in your heart". You may be seeing me today for the first time, but you are all old acquaintances for Me. I know you through and through. My task is the spiritual regeneration of Humanity through Truth and Love. If you approach one step nearer to me, I shall advance three steps towards you. Wherever you walk, I am there. Whomsoever you contact, I am in that person. I am in each. From each, I will respond. You can see Me in one place and miss Me in another. You cannot escape Me or do anything in secret. In past ages, when the power of evil reached a certain stage, the Divine descended into form to suppress the evil and to foster the good. In the Kali age in which we are living, evil has reached new depths. Of all the various ages - each with its own characteristics, the Kali age is the age of the deepest descent into matter and form, away from spirit. We have passed through the lowest point of the pendulum, the dark times of this 20th century and are now beginning the upward climb. The appearance of the Avatar coincides with the darkest hour of the Kali Yuga. People tell me that mankind is on the brink of destruction, that the forces of hypocrisy and hate are fast prevailing on all continents, and that anxiety and fear are stalking the streets of every city and village in the world; there is no need to tell me this, for I have come precisely for this reason. When the world is on the verge of chaos, the Avatar comes to still the storm raging in the hearts of men. Prasanthi, the higher Peace, will be established soon; the demonic deviations from the straight Divine Path will be corrected. Dharma will be revived and re-vitalised in every human community. God incarnates for the revival of Dharma (Righteousness) which includes morality, truth, virtue, love and a host of other qualities that uphold the communities of man as well as the individual. The other purposes usually given - serving the devoted, destroying the wicked, re-establishing the sacred tradition - these are all secondary. For, he who is righteous will be guarded from harm, by righteousness itself; he who is unrighteous will fall into disaster through the evil that he perpetrates. The one task includes all else. For the protection of the virtuous, for the destruction of evil-doers and for establishing righteousness on a firm footing, I incarnate from age to age. Whenever asanthi, or disharmony, overwhelms the world, the Lord will incarnate in human form to establish the modes of earning prasanthi, or peace, and to re-educate the human community in the paths of peace. The Avatar comes to transform humanity but this must take place through the transformation of individuals making up humanity. To raise bread we mix a pinch of yeast into the dough and the action of the yeast spreads throughout the mix, eventually leavening the entire loaf. So the Avatar works through individuals, transforming them into the divinity they essentially are. The light from the many individuals gradually dispells the darkness of ignorance, impacting all of humanity. Through interviews with devotees who come to see him Sai Baba reveals that he knows intimate details of their lives including physical problems and issues dominating their lives, sometimes even events they themselves have long forgotten. Though he left school at the age of fourteen saying "My devotees are calling me" and never read a book, he has been known to speak to people from all over the world using words from their own language. Though he never read the Indian classics he liberally sprinkles appropriate stories from them in his talks. He quotes long passages in the ancient mother language Sanskrit, and assists Brahmic priests in correctly carrying out elaborate Vedic rituals. He tells of undocumented events and conversations in the lives of sages, holy persons, and historic persons as if he were there at the time of their happening. To all who come to him he makes them feel as if he were their own. He constantly exudes bliss and love and all who come to him regard him as they would a loving parent. Sai Baba never appears rushed or hurried and yet he accomplishes more than ten or even a hundred humans ever could. He is in constant motion from early morning until night greeting visitors, going over plans, giving darshan (sight of a holy person) and interviews, taking letters, attending bhajans (religious singing), taking part in and planning ceremonial events. He dedicates his entire life to his devotees and his mission with absolutely no attachment to possessions, personal time, or ordinary human pursuits. My work is ceaseless and so your work, too, is without end. Know that I am within you and without you. There is no difference. Rid yourselves of petty matters for ever more. You are now ME and I am now THEE. There is no difference. My Darshan will pour forth from ME to and through you. You may be unaware of this constant action. Be ever pure in heart and soul, and mankind in your lifetime will benefit from your unique qualities. This is a great chance. Be confident that you will all be liberated. Know that you are saved. Many hesitate to believe that things will improve, that life will be happy for all and full of joy, and that the golden age will recur. Let me assure you that this dharmaswarupa, that this divine body, has not come in vain. It will succeed in averting the crisis that has come upon humanity. In my present Avatar, I have come armed with the fullness of the power of formless God to correct mankind, raise human consciousness and put people back on the right path of truth, righteousness, peace and love to divinity. In this avathar [Divine Incarnation], the wicked will not be destroyed; they will be corrected and reformed and educated and led back to the path from which they have strayed. We have a unique opportunity to take part in the transformation of our planet during this time of great change. We must start by transforming ourselves. I have come to give you the key to the treasure of ananda, or bliss, to teach you how to tap that spring, for you have forgotten the way to blessedness. If you waste this time of saving yourselves, it is just your fate. You have come to get from me tinsel and trash, the petty little cures and promotions, worldly joys and comforts. Very few of you desire to get from me the thing that I have come to give you: namely, liberation itself. Even among these few, those who stick to the path of sadhana, or spiritual practice, and succeed are a handful. I am determined to correct you only after informing you of my credentials. That is why I am now and then announcing my Nature by means of miracles, that is, acts which are beyond human capacity and human understanding. Not that I am anxious to show off my Powers. The object is do draw you closer to me, to cement your hearts to me. I ask only that you turn to me when your mind drags you into grief or pride or envy. Bring me the depths of your mind, no matter how grotesque, how cruelly ravaged by doubts or disappointments. I know how to treat them. I will not reject you. I am your mother. Why fear when I am here? Put all your faith in Me. I shall guide and guard you. The godliness which is present in everybody in the form of a little spark exists in me as the full flame, and it is my mission to develop every little spark of God in everyone to the fullness of the divine flame. Where there is a desire for mental tranquility, I hurry to grant tranquility. Where there is dispiritedness, I hasten to raise the drooping heart. Where there is no mental trust, I rush to restore trust. I am ever on the move to fulfill the mission for which I have come. I never utter a word that does not have significance, or do a deed without beneficial consequence. Transformation must begin with the individual. When the individual changes, the world will change. This transformation has to take place in the minds of men. Right thoughts will lead to right actions. Do not bother about what has happened in the past. Get immersed in the tasks of the present. Render service with a pure and selfless heart. The delight of the individual gladdens the Divine. Equally the Divine esteems you. Do everything with the Lord's name on your lips. Develop all that is good in you and share that goodness with one and all. Everything points to the terror of conflagration coming; and my mission is to preempt the fires by reestablishing dharma and the spiritual law of one God, one religion, one language [of the heart] embracing one humanity. ... I want to build one humanity without any religious, caste or other barriers in a universal empire of love which could enable my devotees to feel the whole world as their family. If God Himself is here to foster Dharma, and you engage yourself in the same task, then you are worshiping Him. Then you are near and dear to Him, for you are serving Him, His devotees, and yourself. My Mission has now reached that point in time when each one of you now has work to do. This planet has a purpose in the great galaxy in which it is held. That purpose is now unfolding before your eyes. I call upon you to radiate the Devotion within you so that its unseen power will envelop all who come into your orbit. To successfully perform your part always remain centered upon me. Allow yourself to impart that purity of heart within you towards all human beings and all living creatures and do not reach for the fruits of your work. This part of My Mission is performed in absolute silence. You are My instruments from whom My love will pour. Be always aware that the moment you let your ego descend upon you, My work ceases. When you have overcome your negative unmindfulness you will again become My source. The multiplication of My Love will be felt throughout the world. I have drawn you to Me. I have made great steps in My Mission over these past Incarnations. So, in your lives, by your examples, live and practise My message, knowing that some will understand and others will not. Have no concern with the outcome of your efforts, for some people are ready and others are not. Each one is free to go his own way in his own time. Many will choose to remain in darkness with all the attachments that hold them back from the true path. But, eventually, their time will come and, one day, all will be re-united in the Kingdom of God. Today the seeds are still in the ground, slowly germinating, as the teachings of the Lord begin to spread throughout the world and infiltrate the mind of man. Soon those seeds will begin to grow, and what emerges will brighten the world as the beauty of the absolute truth begins to reach so many people. It is a process which takes time and the new Golden Age will evolve gradually. So you should live in hope.... Let the divinity within shine forth and become one of the great beacons to light up the world and hasten the arrival of the new Golden Age. It is there now for some, those enlightened souls who have already reached the state of God realisation. It is that awakened state that will lead to the new age. 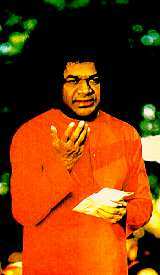 For books and reference materials on Sathya Sai Baba, See Books and References.